Book for this month’s adult/teen book club: Alice’s Adventures in Wonderland. Even though this book club is for older teens and adults, sometimes, when we read kid’s classics, we’ll ask the rest of our families to join us. This was one of those instances. 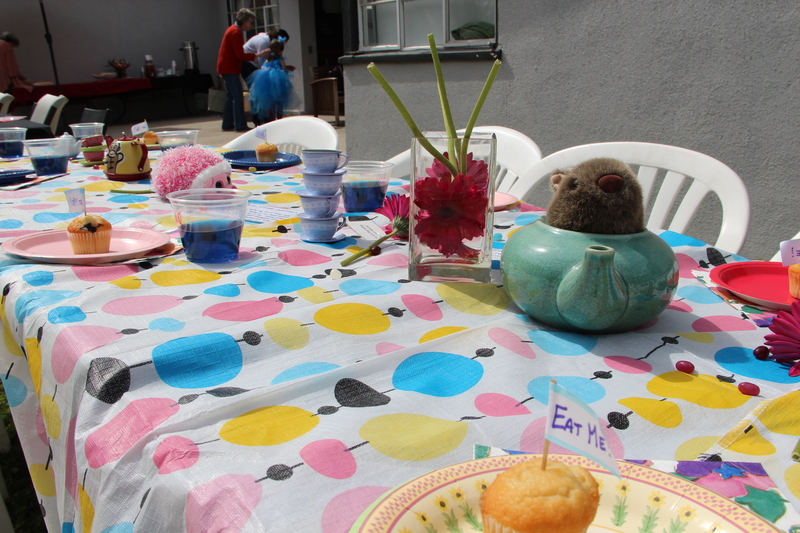 Everything’s a little topsy turvy on Daylight Savings day — the perfect time to have a Mad Hatter’s tea party! This is a family affair, so read the book with your family or individually. BYOTC (Bring Your Own Tea Cup) and wear a hat, obviously. If the kids (and parents) want to dress up like characters, that would be great too! Once it gets closer, and I know who is attending, I’ll set up a sign up list. 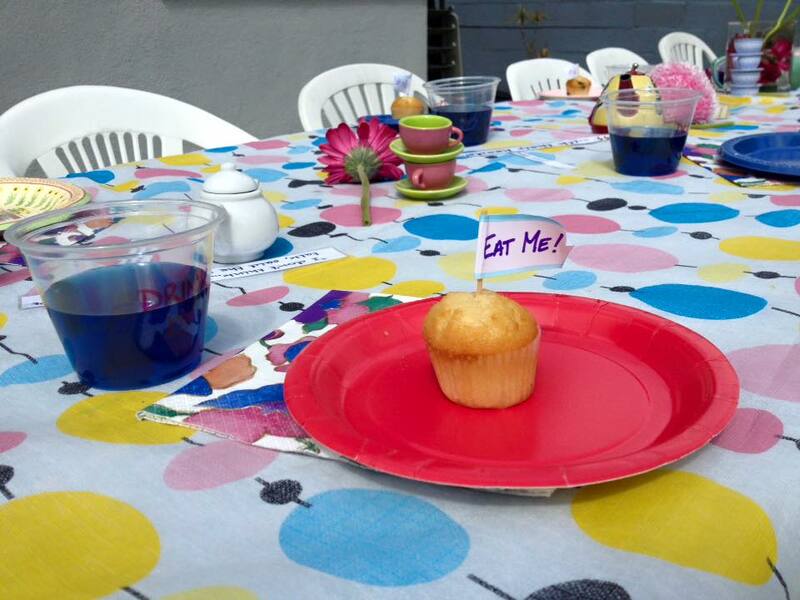 It’s a tea party, so think of things that would would be at a Mad Hatter’s Tea Party. Cliff’s Notes for those of you who really meant to get it read, but (insert excuse) and still want to come party and discuss it. Right before the party, he feel really hard onto the ground. Got a huge bump and a scraped lip. Poor little guy. Due to our party being on and then off and then on again, we had some scheduling snafus with people. But, it was a nice intimate group in the end. 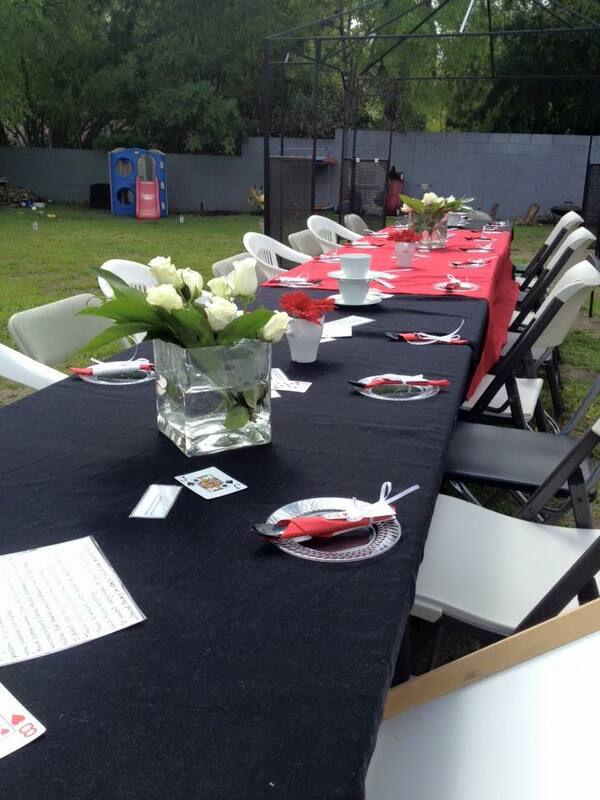 I set up a huge table, like in the book. 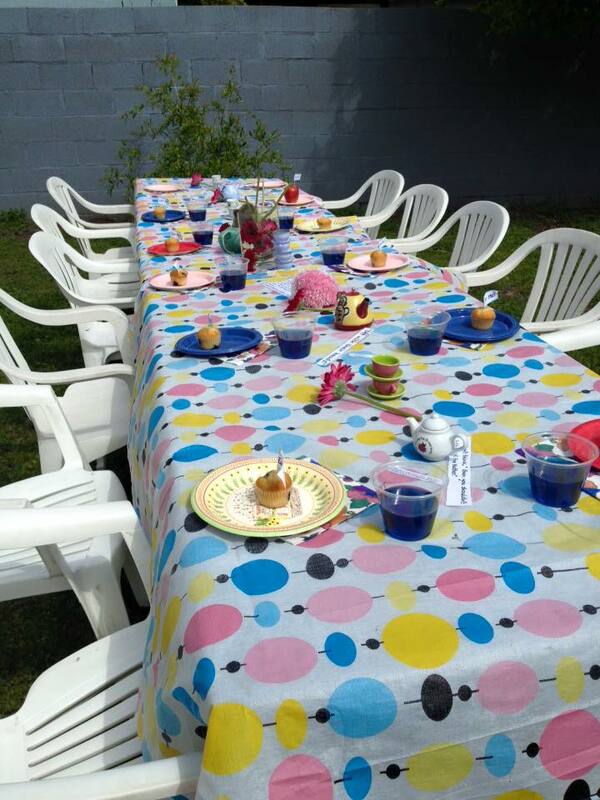 It was a toss whether it looked like the table or just like no one showed up for the party! LOL! At one end, I made it look like some of the plates were used. All along the table were playing cards, Alice’s Adventures in Wonderland questions, book quotes, and Generic Book Club Questions. 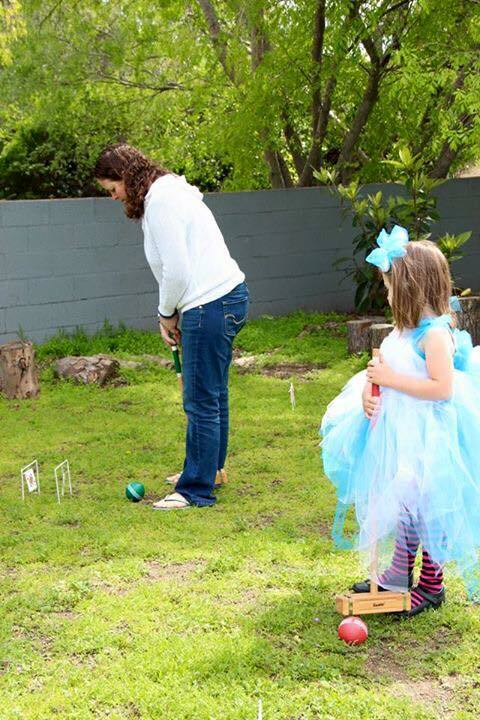 And, of course, we needed to play croquet. I got this set for 80% off!! But, I’ve had a couple people tell me they got a set at a garage sale. So, maybe keep an eye out for those or on Craigslist. I forgot to get a picture of the table full of food. Suffice it to say, we did not go hungry! There were plenty of cookies, watercress sandwiches, spiked tea, and pickle popcorn, of course. 🙂 These were especially apropos. 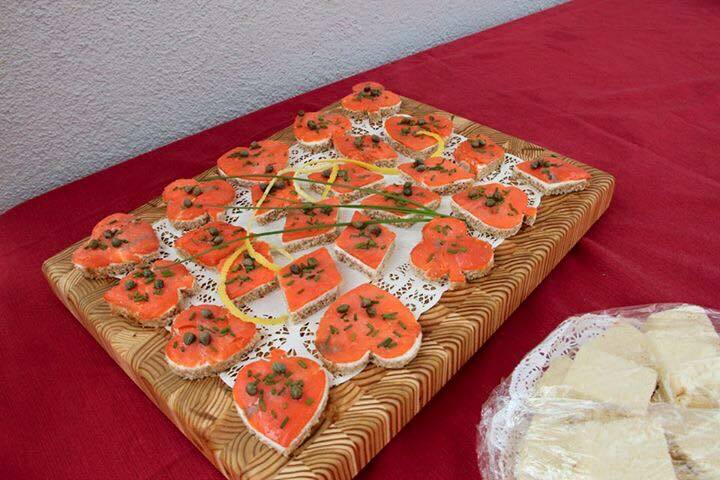 My friend used these cookie cutters to make these cute cream cheese and salmon sandwiches. For my inspiration, more ideas and resources for a more in depth look at the book, see my Book Theme: Alice in Wonderland Pinterest board. Next Post Kids’ Book Club: Up the Rhine to Switzerland!